Famous installationist Ernesto Neto is in KIASMA, his latest installation which shows in Kiasma for 6 months, Neto is well known to the Finnish audience, and to Kiasma as well, because in 2000 and 2009 he came to and make almost similar installation that he is doing now. Neto continuing his style of art that is known as traditional Brazilian Modern art, his type of art is very interesting to many people, he creates an atmosphere that when the viewer goes inside his installation he feels the world that Neto wants, so he leads his viewers by lovely way to his thinking, is it that the duty of art? Ernesto makes his installation on the place where he show by the help of other people, he leads the operation and let others wave the net that he is doing and by the end he puts the artwork on show, he hangs his works both up and down on the selling and on the floor, so when the viewer comes he inters his world immediately. So the viewer participating the artwork is not only he/she sees the art that he does. Neto paling with since and with the mind as well, playing with the sense means that he let his viewers inside the process that he made by his mind and his hand work, so the sense comes from the first moment and playing with the mind, means that he let the viewer take an attitude to his work, they are peaceful works, but they provoke a mind storm, yes it is a peaceful mind storm as the way of peaceful violence that created by the south American. Neto is well known by using the Huni Kuin, by their desire to achieve happiness and good life. Huni Kuin (known also as the Kaxinawá) are one of the indigenous peoples living in the Amazon rainforest. The people has about 8,000 members spread in village communities in the state of Acre in northwest Brazil. Huni Kuin means ‘true people’. Starting in the 19th century, contact with the majority population of Brazil and Peru led to the enslavement of the Huni Kuin and to widespread destruction of their culture. Like many other indigenous peoples, the Huni Kuin fight for their land rights and for the preservation of their traditions. 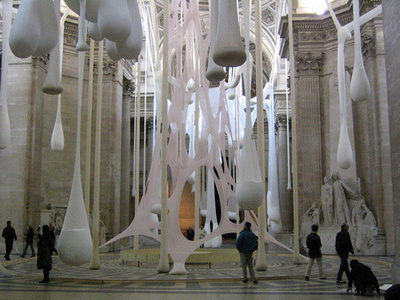 Collaboration with Ernesto Neto is one way for them to make their voice heard. Connectedness with the natural environment and a vital force drawn from unity with other living things are at the very core of Huni Kuin culture. Shamans (pajé) are able to communicate with natural phenomena, animals and plants by changing shape. Ernesto Neto has in recent years studied the life of the Huni Kuin in depth and has attained the trust of the community. He makes Huni Kuin culture known through his art. Neto works for multicultural society, and for the indigenous people who belong to them personally, that is why he show his appreciation to the traditions and to the way the people live and choice to live. This remarkable artist who comes between now and then to Finland plan to come often her that what he said to the Universal Colours when we met his in Kiasma early March.